Yes, there are still Blockbusters in Alaska, at least two of them as I understand it; one in Fairbanks and one In Anchorage. I haven’t seen the one in Fairbanks, but Moni and I visited the one on Anchorage a couple weeks back. The one pictured above was still operating in Wasilla when we passed through on our way to Talkeetna this last Spring. Sadly, it has since closed down. Almost a year ago, we stopped into another Blockbuster in Soldatna, but that one too seems to have closed down. So yes, the great Alaskan Blockbuster lives yet in the wilderness of this great state, but it is an endangered species to be sure. Why have Blockbusters lasted this long here in America’s ‘last frontier’? Well ironic frontier jargon aside, the issue really does have something to do with the rough edges of our state. Simply put, the internet has not fully replaced video rentals in much of Alaska. Many of us have data-caps, and net usage can be quite costly up here. 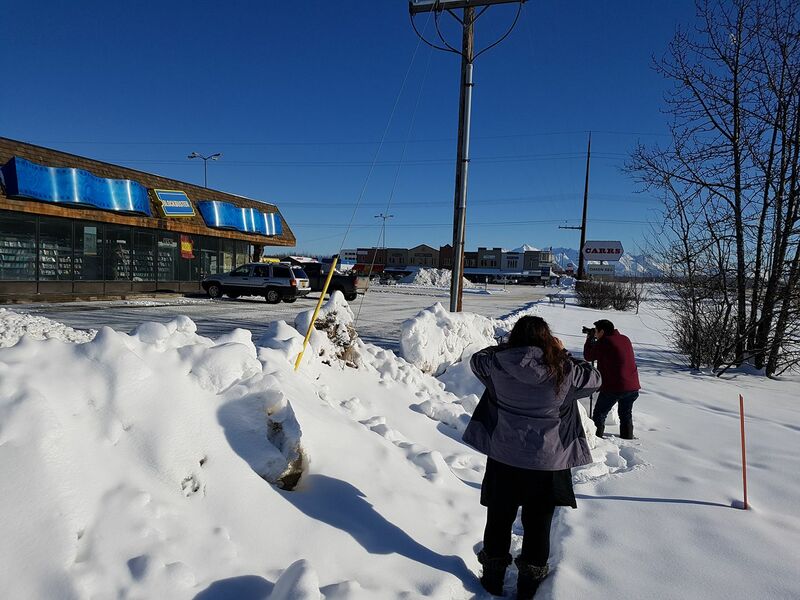 This fact makes video rental a more attractive option, and along with the various rental kiosks, it enables a precious few blockbusters to do business here in Alaska. But times, they are a changing, and we’re now down to two. Many thanks to Moni for contributing the Soldatna pics. My home town in Illinois still has a store called Family Video, a (maybe only Midwest) competitor to Blockbuster. I don’t know how they stay open. Maybe it’s just an older community that hasn’t embraced Netflix? Wow – amazing! Video stores had so completely fallen out of my mind that I had to think for a minute what a “Blockbuster” might be. Is it some sort of ice removal equipment maybe? *laughing* Thanks for taking me on a visit back to 1995! An easier time, a decade or so ago. Some days I think it would be lovely to return there. Thank you for ensuring that the sight of this rare species will be preserved for generations to come. With the last breeding pair separated by such distance it seems unlikely that they will reproduce and that extinction is inevitable. This is exactly what photography provides for the world. Did it have a phone booth inside? At last catching up to this post — and surprised to be knocked over by a rogue wave of nostalgia. Looking at those pics, I am once again a mom of preteen boys, roaming the aisles on a Friday night, looking for the weekend’s entertainment (and grousing about the late fees from the previous visit). Good times! Video rental stores are still important. Especially in places with data caps and slow internet. But that is not the only reason. Some have movies that appeal to niche markets. I think they would be around for some more years.